Whisk together the herbs, oil, lemon juice and capers; season to taste with salt and pepper. Grate, shred or julienne the carrots and place in a large bowl. 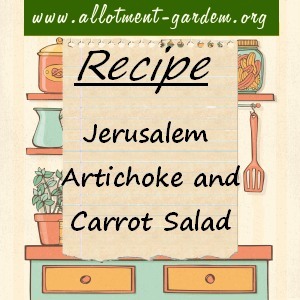 Thinly slice or julienne the Jerusalem artichokes (or cut into thin matchsticks); add to the carrots, and immediately add the vinaigrette and toss together. Cover and let it sit at room temperature for 30 minutes, before tossing again and serving. Delicious with a toasted cheese sandwich or with potatoes. You can prepare this salad a few hours in advance and keep in the fridge until need.